There are several advantages to using in-plane imaging for regional anaesthesia. The needle shaft and tip are seen and this allows for more accurate positioning of needle tip in relation to nerve. With the tip in view, accurate visualisation of the spread of LA around the target nerve is achieved. Long axis needle imaging does present a challenge; maintaining alignment between the US beam and needle is difficult. The following steps can assist in making needle imaging easier. This has been covered in detail in the knobology section but as it is usually the first step in performing an USRA procedure, it is a good reminder to put it at the beginning of the list. Set frequency, depth, gain, focus (if included). Always consider the use of colour flow doppler and actively look for vessels in the area you are about to needle. Attempting to align the narrow US beam with the narrow needle is difficult. If care is taken to position all the components during the block procedure, block performance becomes much easier. The patient should be positioned in a way that allows the operator to reach the block area comfortably. The height of the bed and the position of the patient on the bed should be optimised for operator comfort. The screen of the US machine should be positioned directly in front of and above the block area. This line-of-sight positioning means the operator only has to move his eyes and hands during the block procedure. Nothing else needs to be moved at all. The operator can look down at the needle-probe alignment, and then up at the image on the US screen. In some situations, it is difficult to achieve line of sight with the US machine; in this situation it is possible to use a secondary LCD screen positioned over the block area. This can assist with line-of-sight and minimise operator movement. Figure 1b shows the ideal arrangement for ease and accuracy of needle imaging. The key to good needle imaging is the ability to make small movements of the probe. In order to achieve this, the operator must control the probe precisely and this is best achieved by stabilising the probe hand on the patient. This means holding the probe low down (as shown above). There are several ways to move the probe during block performance and these are described by the acronym PART for Pressure, Angulation, Rotation and Translation (or sliding). Try to make only one change at a time and then see what result is achieved in terms of improved nerve imaging or improved needle imaging. Next it is important to make very small movements; novices tend to make large movements of the probe and miss seeing the optimal image as it whizzes past. Finally move either the probe or the needle at one time, not both together. If the needle imaging is excellent, the needle can be moved towards the target nerve. 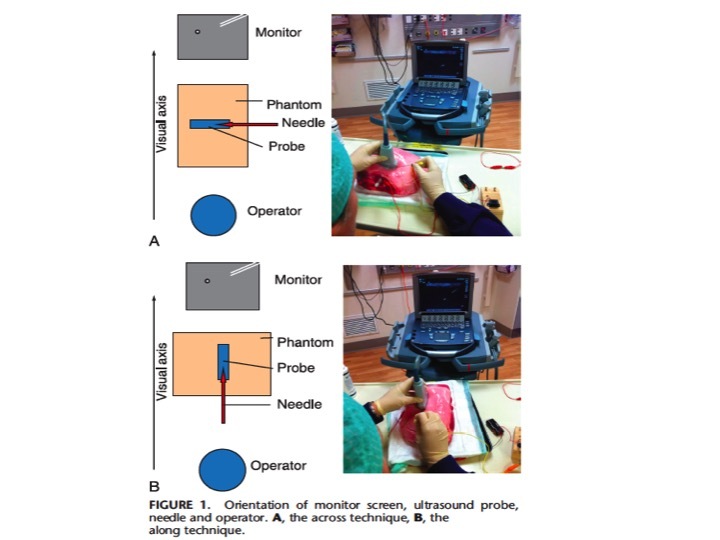 If needle image quality declines, the needle is fixed in position and the probe is moved either by sliding the probe over the needle (translation) or angling the probe over the needle. Once the needle image is optimised, the needle can be advanced once more. The best US image is obtained when the US beam hits the needle at right angles, as the reflected energy is greatest (brightest image). This is hard to achieve if the needle is inserted immediately adjacent to the US probe. When inserted in this position, the needle will often take a fairly steep angle towards the nerve with a relatively poor needle image as a consequence. If the needle insertion point is adjusted to produce a flat needle angle, the needle imaging can be improved considerably. Due to the longer needle path with this technique it is important to ensure that the area is scanned to prevent inadvertent damage to other structures, and to anaesthetise the area with local. There are some additional techniques for further enhancing needle imaging discussed below. The ability to see a needle in the imaging field is dependent upon the reflection pattern of the needle. Superficial targets enable the use of shallow needle angles with good needle imaging as mentioned above, and many of our blocks fall into this category (e.g. interscalene, supraclavicular, axillary, median, ulnar). Deeper targets demand steeper needle angles. Conventional needles passed at angles at 45 degrees or more become invisible and needle position is guided by tissue movement and hydrolocalisation. There are several additional techniques that can aid needle imaging for more deeply placed targets or steeply angled needles. As mentioned earlier a flat needle insertion angle allows better imaging. This effect can also be produced by heel and toeing of the probe as shown below. Figure 3​. Probe heel and toe and entry away from probe improved needle to ultrasound beam angle. The same effect can be achieved in newer ultrasound machines using a feature called beam steering. In this modality, the US probe can angle the beam towards the needle thus improving the needle-image quality. The angled beam does mean that the improved view is only available over a portion of the screen display which makes use for deep structures less easy. Figure 4. Ultrasound beam steered at 20 degrees. Note there is no needle enhancement outside this beam shown on right side of image. If the needle crosses into this area it may become invisible. Improved visibility ONLY in the light blue area. This may help with deeper blocks as the divergent beam strikes the needle shaft at a greater angle as it passes towards the target. As the needle approaches the target however the angle advantage reduces. Fig 5. Curvilinear probes help needle imaging near the surface, and by angulation (heel an toe) can image a needle passing at a steeper angle than a linear probe. 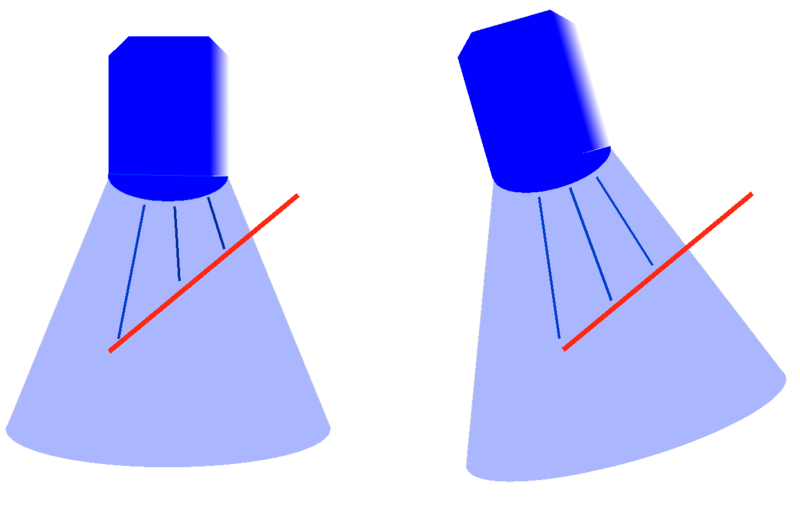 The bent tip of the Hustead or Tuohy needle has an increased reflection pattern and a recognisable shape. Echogenic needles improve the reflective properties of the needle by coatings or surface irregularities and allow for improved needle imaging at depth. There are needle guides available for both in plane and out of plane needle imaging. They can be slightly fiddly to use but may significantly improve needle-imaging quality especially for inexperienced operators. Several manufacturers have developed electromagnetic needle tracking systems able to show the needle trajectory and the position of the needle tip. These make needle tip positioning more accurate but it is important to be aware that the needle still passes through tissues which are not shown on the monitor screen so pre-scanning the route is still advisable to prevent injury to other structures. Should the needle and probe not align perfectly, only a section of the needle will be imaged. Figure 7. If the needle and probe are not perfectly aligned not all the needle will be imaged. The axis of this rotation error can be deduced from where the needle is seen in the image. A similar appearance may also be the result of a bent needle. The essential skill is to be able to recognise and follow the needle tip. The shape of the tip and the reverberation pattern from the tip are important features to focus upon. Out of plane imaging is the standard approach for ultrasound guidance for vascular access. It is also widely used for regional anaesthesia and although it has some advantages, the limitations of the technique need to be understood to use it safely. 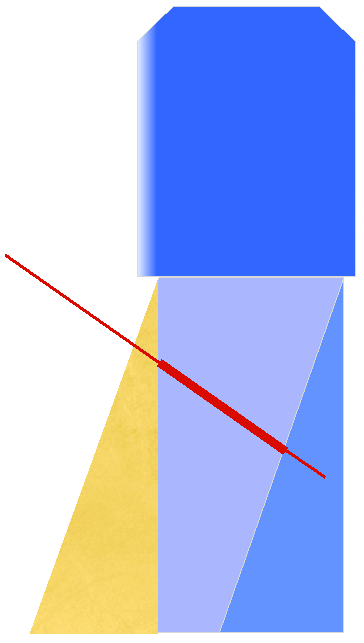 As the needle crosses the US beam at 90 degrees, it is not well visualised; only a small bright spot is seen with a distal shadow (acoustic shadowing). If the ‘bright spot” is taken to be needle tip but is actually needle shaft, the needle tip may be advanced into an adjacent structure such as vessel, nerve or lung. It takes some practice to understand how easy it is for the tip to be beyond the US image and therefore not visualised. It is also important to realise the acoustic shadow indicates the direction of the ultrasound beam and does not confirm needle direction. Jiggling of the needle may help locate the needle tip by observing tissue movement. Hydrolocalisation  allows the tip of the needle to be identified helps find the depth of the needle. This usually utilises a steep needle angle with the needle adjacent to the probe. If fluid is injected but does not immediately appear in the US image, it means the tip is not being visualised. The probe must therefore be moved until the fluid IS seen. This sequence can be repeated as the needle is moved slowly closer to the target. A useful approach to out of plane imaging. The needle penetrates the skin at the side of the probe and will be invisible at first. The point at which it will become visible in the ultrasound beam can be predicted by trigonometric principles. 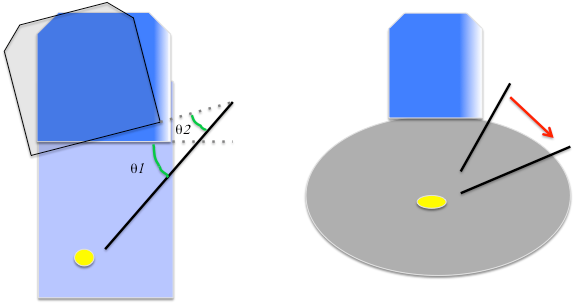 A needle entering one cm from the probe at an angle of 45 degrees to the probe will be seen at a depth of one cm. A needle entering at 60 degrees will be seen at a depth twice that. We can therefore predict when we should see the needle from our insertion point relative to the probe and the angle between probe and needle. A high needle angle allows for more consistent imaging of the needle tip as the needle is advanced by keeping the tip in the thin ultrasound beam for longer. 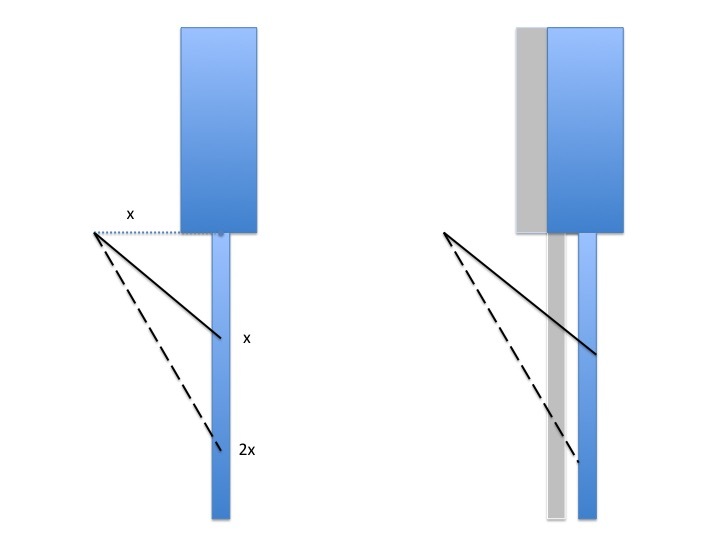 Whichever angle is used the tip will pass through the beam and only the shaft will then be visualised. To ensure the tip is being tracked you need to translocate the probe backwards and forwards to follow needle movement. With practice both the probe and needle hands can be moved SLOWLY at the same speed to track the tip. Fig 8. On the left the depth at which the needle tip appears is angle dependent. At 45 degrees depth equals distance from the probe (x), at 60degrees the needle will appear at a depth of 2x. The right hand graphic shows that as the needle advances the probe needs to move with the needle to maintain imaging of the needle tip. 1. Sites, B.D., et al., Artifacts and Pitfall Errors Associated With Ultrasound-Guided Regional Anesthesia Part II: A Pictorial Approach to Understanding and Avoidance. Reg Anesth Pain Med, 2010. 35(2): p. S81-S92. 2. Ng, A. and J. Swanevelder, Resolution in Ultrasound imaging. Continuing education in Anaesthesia, Critical Care & Pain, 2011. 11(5): p. 186-192. 3. Tsui, B., Dextrose 5% in Water as an Alternative Medium to Gel for Performing Ultrasound-Guided Peripheral Nerve Blocks. Reg Anesth Pain Med, 2009. 34(5): p. 525-526. 4. Shankar, H. and P.S. Pagel, Potential Adverse Ultrasound-related Biological Effects: A Critical Review. Anesthesiology, 2011. 115: p. 1109-1124. 5. Gray, A.T., Acoustic shadowing from neuraxial bone. Anaesthesia, 2012. 67: p. 75-6. 6. 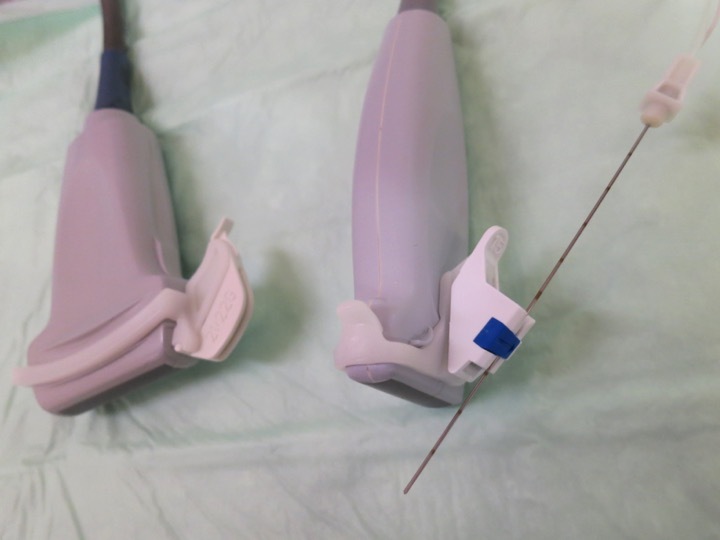 Gray, A.T. and I. Schafhalter-Zoppoth, “Bayonet Artifact” during Ultrasound-guided Transarterial Axillary Block. Anesthesiology, 2005. 102(6): p. 1291-2. 7. Tsui, B. and D. Dillane, Needle Puncture Site and a “Walkdown” Approach for Short-Axis Alignment During Ultrasound-Guided Blocks. Reg Anesth Pain Med, 2006. 31(6): p. 586-587. 8. Bloc, S., C. Ecoffey, and G. Dhonneur, Controlling needle tip progression during ultrasound-guided regional anesthesia using the hydrolocalization technique. Reg Anesth Pain Med, 2008. 33(4): p. 382-3. 10. 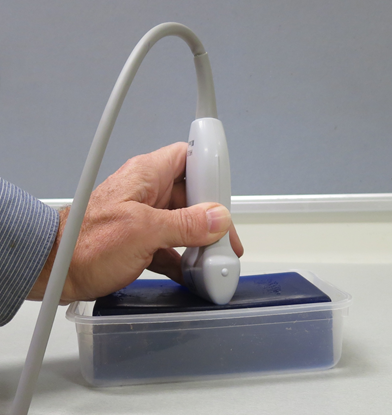 Hebard, S. and G. Hocking, Echogenic Technology Can Improve Needle Visibility During Ultrasound-Guided Regional Anesthesia. Reg Anesth Pain Med, 2011. 36(2): p. 185-189. 11. Schafhalter-Zoppoth, I., C.E. McCulloch, and A.T. Gray, Ultrasound visibility of needles used for regional nerve block: an in vitro study. Reg Anesth Pain Med, 2004. 29(5): p. 480-8. 12. Takayama, W., et al., [Novel echogenic needle for ultrasound-guided peripheral nerve block "Hakko type CCR"]. Masui, 2009. 58(4): p. 503-7. 13. Edgecumbe, H. and G. Hocking, Sonographic Identification of Needle Tip by Specialists and Novices A Blinded Comparison of 5 Regional Block Needles in Fresh Human Cadavers. Reg Anesth Pain Med, 2010. 35(2): p. 207-211. 14. Chin, K.J., et al., Needle visualization in ultrasound-guided regional anesthesia: challenges and solutions. Reg Anesth Pain Med, 2008. 33(6): p. 532-44. 15. Klein, S.M., et al., Piezoelectric Vibrating Needle and Catheter for Enhancing Ultrasound-Guided Peripheral Nerve Blocks. Anesth Analg, 2007. 105: p. 1858-1860. 16. Faust, A.M. and R. Fournier, Color Doppler as a surrogate marker of needle-tip location in ultrasound-guided regional anesthesia. Reg Anesth Pain Med, 2009. 34(5): p. 525. 17. Chiang, H.K., et al., Novel Epidural Needle with Embedded High-frequency Ultrasound Transducer—Epidural Access in Porcine Model. Anesthesiology. 114(6): p. 1320-1324. 18. Neal, J.M., et al., ASRA Checklist improves trainee performance during a simulated episode of local anaesthetic systemic toxicity. Reg Anesth Pain Med, 2012. 37(1): p. 8-15.